Applied Aerospace Structures Corp. (AASC) specializes in the design, fabrication and testing of lightweight structural assemblies, focusing on high-performance engineered structures for space, aircraft and ground systems. In business for over 50 years, AASC has remained committed to being an innovative and responsive supplier to the space and aircraft industry. It produces diverse composite aircraft hardware and components, while other structures support satellites, launch vehicles, manned space missions and ground-based defense applications. The company’s air space and aircraft divisions are involved in many directed-energy weapons programs. 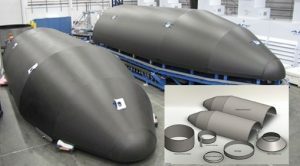 AASC fabricates large composite aerodynamic coverings to support the thermal stability, structural and dynamic requirements of precision weapons. It was tasked by its customer, federal research facility Lawrence Livermore National Laboratory, with building an aeroshell, which is an aerodynamic cover for its advanced Kinetic Energy Projectile missile. This weapon is designed to fly through low-orbit space and reach targets anywhere in the world within 30 minutes. The Lab had scheduled a rocket sled test at the Holloman High Speed Test Track in New Mexico to assess the performance of this new precision-effects warhead. This track, nearly 10 miles long, is used for dynamic tests of missile components at hypersonic speeds, and under stringent conditions, in place of costly live-missile launches. The Lab previously built an aeroshell prototype using advanced composites to evaluate how the missile would go through the atmosphere. This time, the Lab required a more economical aeroshell to test the shape of the charge. AASC needed a low-cost material that was easy to machine in-house for rapid prototyping of the large aeroshell. It had to remain stable and accommodate its low-temperature, multistep curing processes. And, because the test track is in high demand all year long, AASC had a can’t-miss date. Applied Aerospace Structures Corp. had relied on General Plastics’ LAST-A-FOAM® FR-7100 Multi-Use Core Series material for other projects – for machine tools, as an assembly tool that holds reflectors for SpaceX, and to machine holding fixtures. Already familiar with its physical properties and advantages, AASC selected the 30-pound density of this rigid polyurethane foam to mold tools for curing graphite laminates to the molds it machines in-house. The primary driver prompting its selection for this test aeroshell was low cost: The structure was 10′ feet long and nearly 4′ tall – and a one-time build. The application did not warrant the use of invar, steel, carbon or aluminum tool that would have been process heavy and therefore, more costly. Additionally, with this foam, AASC was able to easily modify the mold tool so it was used as the machining fixture and then the assembly fixture. This helped them save on time and cost. The customer also wanted a material they could easily machine to tight tolerances in-house to accelerate production. What’s more, General Plastics’ foam supported superfast turnaround. Within four weeks of issuing a purchase order, AASC received and machined a large bonded block of FR-7130 foam into a finished prototype tool. This contrasts with the 12-16 weeks required for a metal tool: fabricating an egg-crate backing structure, forming skins, welding it, forming a shape post and machining accurately to the specified shape. The sled or nose cone resembles a flattened diamond shape built with two upper and lower aeroshells approximately 5/8″ thick. The foam was used for the two leading-edge tools, to create tools for the two inner supports, and to produce four internal structural components. In addition, the upper and lower aeroshells were used for layup and curing of the skins, and to help build the assembly. AASC applied a low-temp epoxy primer to achieve a very smooth surface on the foam tools. The graphite laminates are cured on the foam tool at 170º Fahrenheit, then the parts were removed from the tool and fully cured at 350º in the autoclave. There was no laminate spring back, bowing, creep or change in its properties, and there were no issues in processing. Ultimately, the prototype was readied in just four months. On test day, the prompt strike warhead – encased in AASC’s prototype aeroshell – rocketed down the Holloman test track at mach 2 speed. In addition to collecting critical predictive data during its 5-second run, it proved the value of using General Plastics’ FR-7100 Multi-Use Core Series for low-cost, fast-turn prototyping.